You’ve got to love Regina weather, right? If it isn’t snowing, with a windchill pushing the temperature well below -50 C, then it is raining, raining, raining!! 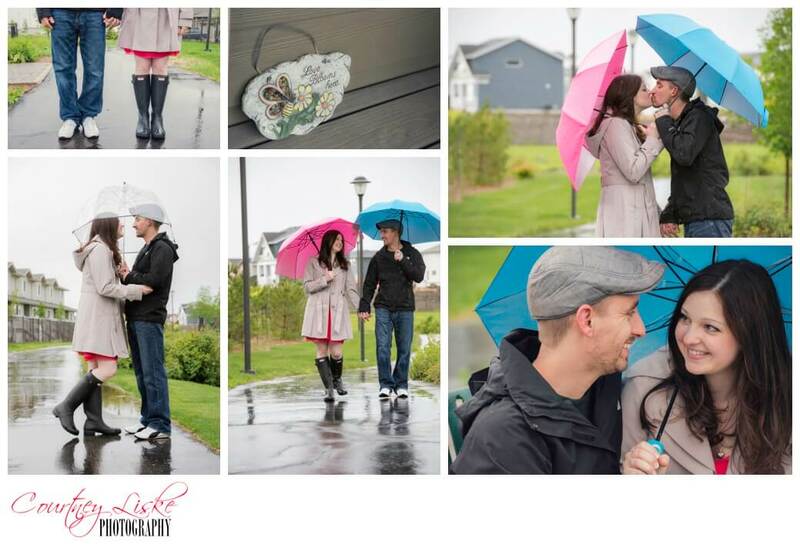 Not your typical June day for an engagement shoot, but Keith and Janel didn’t let a little rain spoil their session! I knew we were in for a fun session as we walked up to Keith and Janel’s Regina home. There to greet us, was a brightly coloured gnome, who held up a ‘welcome’ sign as we rang the bell. Then, some more gnomes greeted us inside- love those quirky little things unique to each person’s home! Keith and Janel live near a lovely little park in Regina, where we had a chance to head out for a little walk, and break in their ADORABLE ‘his’ and ‘hers’ umbrellas. These colourful umbrellas were picked out by… wait for it… Keith! What groom-to-be can claim an awesome idea like that? Janel, you should be proud. The rain came down steadily, but that did not stop these two from having a good time together. 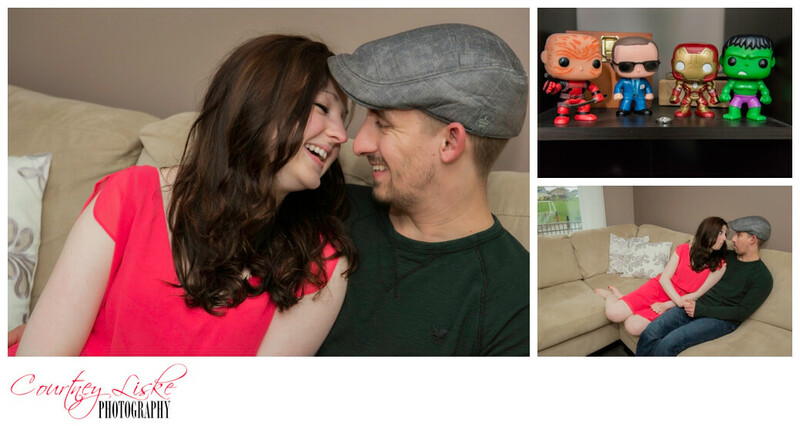 There are those things that make each couple so unique- those things for Keith and Janel were the gnomes, as well as Marvel items around their condo. When asked who the Marvel fan was, I was so pleasantly surprised to hear it was actually Janel! She shared with us one particular item that had been received as a gift, and she had actually tried to impress Keith with when they first met. I love so much that it was her trying to impress him with her Marvel stuff- so great! Living in Regina, or anywhere in Western Canada really, you can easily find Saskatchewan Roughriders fans. Keith and Janel are two in that mighty sea of green. 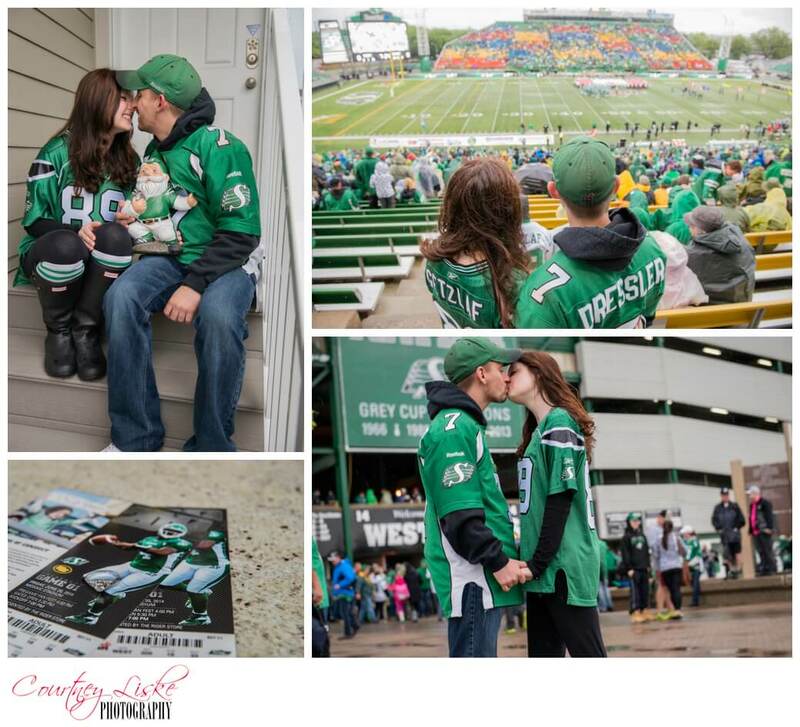 They are season ticket holders, and lucky for us, we were able to take some photos at the Roughriders’ pre-season game at Mosaic Stadium. Unfortunately, the Riders didn’t pull out the win, but many laughs were shared, and we had a great time, although we were a bit soggy by the end! Keith and Janel, you were such a joy to work with- we had such a great afternoon with you both! The love you share is so evident, even in the way you guys are incredibly goofy together. Thank you for choosing Courtney Liske Photography to capture this exciting time in your lives. We are very much looking forward to your wedding this August in Regina!